At approximately 23:40 on the 16th of April, Adelaide experienced a small earth tremor. It was my first! Fortunately there are no collapsed buildings that I know of, but unfortunately I can’t show any media to prove it happened. 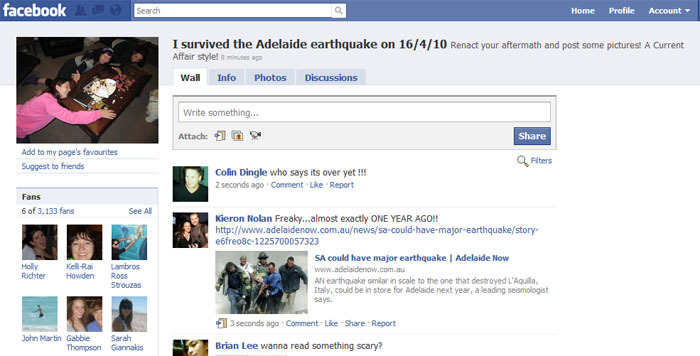 Twitter is abuzz though – within 3 minutes of the tremor, there were more than 300 tweets about the adelaide earthquake. A Facebook group was up within 5 minutes, and as of this post twenty minutes after the quake, has 3000 fans. What does all this tell us about our survival instincts in the face of a natural disaster? Just that people gravitate to the most comprehensive and accessible information source. It’s a nice way of confirming suspicions, and I doubt that people at the epicentre would continue making Twitter jokes about ‘something interesting happening in Adelaide’ if it turned out to be a more serious quake. Personally, I can’t wait to see the inevitable sensationalist headlines in the Advertiser, and it’s interesting to see how many people really hang out on Facebook on a Friday night (I was working, I have an excuse). Updated: Apparently 5AA have reported the Earthquake to be 3.2 on the Richter Scale. Nice. a few moments after I was awaken by the earthquake I was over at the neighbours to see if they had felt it as well. yes, we googled all we could think of but the only thing with up to date information and confirmation that I, and others were not imagining it was the streams of twitters. I only wish I knew what suburbs they were twittering from, within minutes I had sighned up to share my experience! It’s really interesting that we can now report to each other much faster than news networks can get us the information. Although crowdsourced news isn’t necessarily reliable, it definitely gives us a feel for the big picture. The only damage I’ve seen so far is a 1mm crack in someone’s ceiling on Twitter. I think we’ll probably be OK! Lol aparently on the news were going to die in 6 months, thats what my friend saysm anyone beg to differ? The news always says we’re going to die in 6 months, that’s what it’s for.